Candidates of Karnataka state who successfully applied for Forest Guard Recruitment 2016 want to know about their Syllabus. Karnataka Forest Guard Syllabus and Exam Pattern 2016 is very important. To get Forest Guard Post 2016, candidates will have to cross Written Exam round and Personal interview Round. Online Application process of Forest Guard recruitment 2016 will be ended on 17th may 2016. Candidates should not stay free this time. Candidates will need to be passionate for Forest Guard post 2016. Main info regarding [highlight color=”yellow”]Karnataka forest department syllabus 2016[/highlight] available here and if applicant wanted to checkout online written upcoming examination syllabus then they might allowed to checkout online Examination Syllabus- Paper Pattern online in pdf as we have mentioned here on this Page of Karnataka forest officer syllabus 2016. There are total of 555 vacant posts available of Karnataka Forest Guard. Various helping books are available online so that applicants can prepare very well for this competition. Due to large number of candidates, competition level will be automatically high. Karnataka Forest Guard Syllabus and Exam Pattern 2016 are mentioned below of this page. After checking it, start preparation. We have provided some preparation tips also for candidates. If you follow our preparation tips then you can easily crack Forest Guard Exam 2016. At first check all preparation tips and then download Forest Guard Syllabus and Exam pattern 2016. How to Prepare for Forest Guard Exam 2016? Collect all Study material at first for written exam. Also download previous year exam papers. Do practice on Model Test papers every day. Solve one paper per day. Study everyday for at least 6 hours. Internet is good source to get various helps in getting good marks in exam. Jon groups on Social Networks of same Stream and Exam. Ask problems and get solutions instantly. Karnataka Forest Department will organize Written Examination in various exam centers. 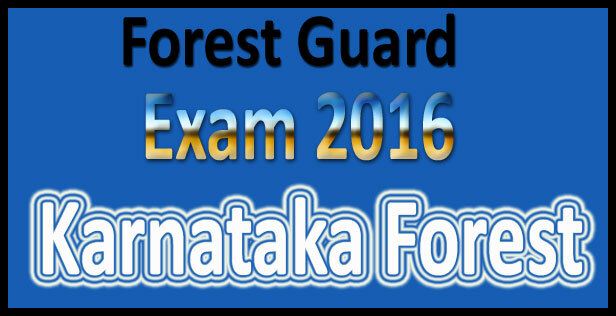 Candidates will get to know about their Exam center with their Forest Guard call Letter 2016. Candidates will get Forest Guard Admit card 2016 before 15 days of the examination. Officials will soon declared Written Exam date of Forest guard on official website. All information regarding Forest Guard Exam 2016 is available here. Collect info and immediately start studying on that. You should not waste this priceless time. We wish candidates all the very best for Forest Guard Written Exam 2016. Exam will be based on Pen and Paper. All Questions will be of Multiple Choice Questions. Candidates will get 2 hours to complete this examination. There will be total of 100 Questions in the written examination. Main topics of the Forest Guard paper are general knowledge and Mathematics. No negative marking applicable for Forest Guard Exam 2016. Candidates should stay in touch with official website of Karnataka Forest Guard and get all information easily. Forest Guard Syllabus and Exam Pattern 2016 is also available on official website full details. If you want to check major and minor points of Mathematics and General Knowledge subjects the we have also provided all points below. Download online Karnataka forest department syllabus 2016, Karnataka forest officer syllabus 2016 to prepare well for upcoming written examination for Karnataka forest department and Previous year model Question Papers with Latest examination books might help you out to checkout online easiness while in scoring good marks. Information regarding Karnataka forest department syllabus 2016, Karnataka forest officer exam Pattern- Previous year Model Question Papers available here on Postalert by staying in touch with our social Media Portal Pages and get exact main news info on daily base scheduled regarding recruitment written exam.